Color-screaming and wonder-dreaming, Terry Gilliam’s adventure fantasy THE IMAGINARIUM OF DOCTOR PARNASSUS might have been one of his better characteristically surreal dark comedies had his star Heath Ledger not been claimed by that darkest of comedies – death. We watch this MUNCHAUSEN-like parable unfold with the constant distraction in the back of our heads that IMAGINARIUM – not THE DARK KNIGHT – is Ledger’s actual swan song. We try to forget but we know anyway that he died before principal photography was completed, so had to be replaced by other actors (Gilliam’s filmmaking style at least lending itself to this sad necessity, so that the replacement actors – Johnny Depp, Jude Law, Colin Farrell – almost seem to fit as substitutes. Almost); we know that rewrites and re-shoots and re-edits had to surgically be performed; we wonder at the mood on set; we marvel at the professionalism of the other actors rising above the tragedy to finish the job seamlessly – and all this contemplation colors our enjoyment of a movie that should be taking us on an altogether different contemplative ride. The troupe consists of the aged wizard Parnassus, his 16-year-old daughter Valentina (Lily Cole, blessed with the type of cleavage that can earn her a Porsche), young Anton (Andrew Garfield, with a crush on Valentina), and midget Percy (Verne Troyer, at last shucking off the specter of Mini-Me with a sizable performance). On their travels, they rescue a man hanging by his neck from a bridge. 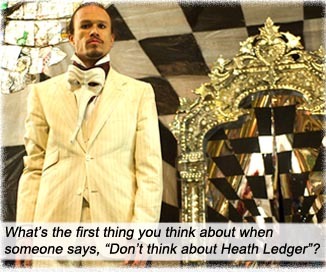 It is grifter Troy (Ledger); how ironic that Ledger’s first appearance in the film is in mock death. The subplot – which might have been the main plot until… – is the competition between Parnassus and Mr. Nick (wily Tom Waits) over capturing the most human souls. Nothing is said outright, but we get the impression Nick is a devil and Parnassus is some kind of Eternal (god? angel? immortal?). A feature of Parnassus’s show is an unpredictable magic mirror – the Imaginarium – that no one is meant to step into, but which, of course, everyone steps into. Every time Troy steps into the mirror, he becomes someone different, either Depp, Law or Farrell. When he steps out again, he is once again Ledger. We realize all the “real world” scenes must have been completed before Ledger’s death, only the surreal Imaginarium sequences featuring the other three actors, who gave graciously of their talents. “Dedicated to Heath.” Just one of those tragedies that befall us all, and Gilliam must live through it and move onto his next project, all contractual obligations fulfilled. Apologies, but that Heath Thing is all anyone can talk about – it’s all I’M talking about. See what I mean by distraction? It’s going to take either a few years or a frontal lobotomy to truly enjoy this film on its existing merits. Writers: Terry Gilliam, Charles McKeown. Starring: Heath Ledger, Christopher Plummer, Lily Cole, Andrew Garfield, Johnny Depp, Jude Law, Colin Farrell, Verne Troyer, Tom Waits.